28 February 2013, 09:09 a.m. Hiring great people and creating a culture of achievement that is fun, focused and able to get challenging tasks done is not an easy task. Keeping that culture strong and focused on the customer takes a unique leader that consistently earns trust and respect. Those are the qualities I think of whenever I’m asked to recommend the best cloud computing companies to work for. Using the scores from Glassdoor.com I’ve put together the table below comparing cloud computing companies and when available, the percentage of employees who approve of their CEO. If you’re not familiar with Glassdoor, it’s a website that gives employees the chance to rate their companies and CEOs anonymously, along with reporting salaries. Friends in the Human Resources community tell me it’s an effective recruitment site as well. 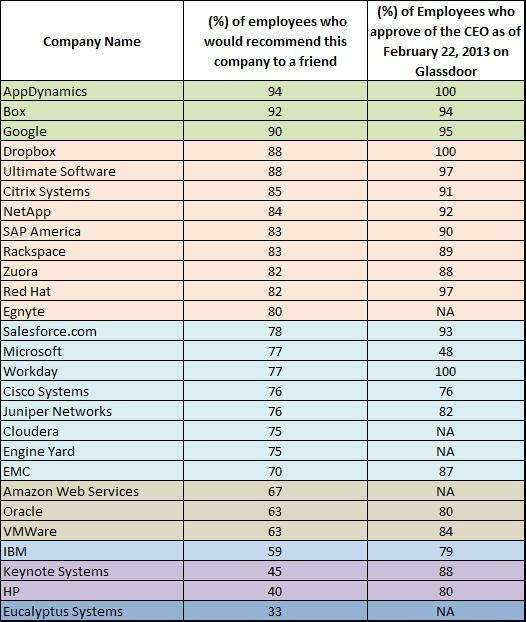 Cloud computing companies are sorted based on the percentage of employees would recommend their company to a friend. I added in CEO scores to get a sense of which companies have a significant gap between morale and the perception of the CEO. As of today according to employee rankings, Microsoft has the largest gap between percentage of employees who would recommend the company to a friend (77%) and CEO rating (48%). 6 Mar 2013, 12:28 a.m. I would also suggest Rob Clyde, CEO of Adaptive Computing.